The PagePro 1380MF combines desktop convenience and high-speed laser-quality output into a compact multifuctional device that prints, copies, and scans. First print out in as little as 17 seconds subsequent prints at 21 pages per minute. High-quality monochrome laser produces solid blacks, fine text, and smooth grayscale shadings. Copy and scan documents up to 8.5" x 11.69" from the flatbed glass and up to 8.5" x 14" from the optional automatic document feeder. Reduce or enlarge copies from 25% to 400%, or adjust density and quality mode from front panel. from the flatbed glass or automatic document feeder. 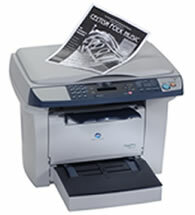 The automatic document feeder provides timesaving, unattended copying. In scan mode, use LinkMagic or ScanSoft PaperPort® SE from Nuance to scan and edit images in 24-bit color at 1200 dpi to your PC, to PDF, to email, or to a variety of common software applications. Optical Character Recognition (OCR) function converts scanned documents to editable text. One year on-site warranty and Free U.S.-based technical support for 5 years.